Bodyboards -- also referred to as boogie boards -- allow an individual of any age to ride waves while lying on their stomach on the board. Whether you rent or buy a bodyboard for your child, choose a bodyboard based on your child's size. This can help ensure the safety of your child while bodyboarding and allow for maximum performance. Look for a bodyboard that grabs your child's interest. Bodyboards come in a variety of different colors and themes, including sports teams and cartoon characters. Visit a surf shop, sporting goods store or novelty store at the beach to look for bodyboards. Position a bodyboard in front of your child. Place the bottom of the board on the ground. 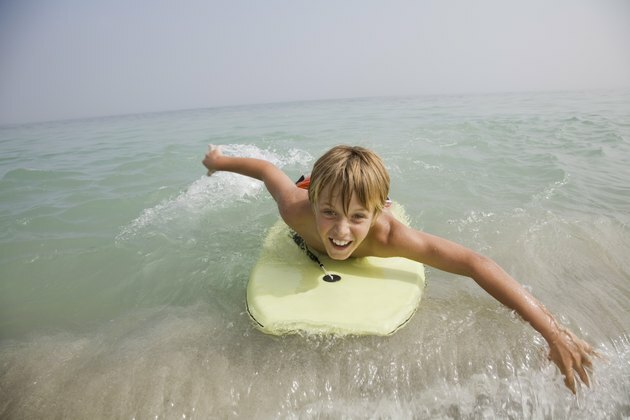 The bodyboard should be within 1 inch above your child's naval. This length allows your child to catch waves easily. Boards that are too big can be difficult to hold. Boards that are too small may cause your child to sink. For rapidly growing teens, allow 2 inches above the naval for growing space. Look for sizing charts, especially if your child is not with you while buying a bodyboard. A 38-inch board is for individuals up to 5 feet 4 inches tall with a weight between 65 and 85 pounds. A 40-inch bodyboard is recommended for those from 5 feet 5 inches tall to 5 feet 7 inches and weigh between 110 and 130 pounds. There are also youth-size boards that work well for children under 65 pounds. Never leave your child unattended while using a bodyboard. Is Weight Watchers Good for 12 Year Olds?